The EL4018 analog output terminal generates analog output signals in the range between 0 and 20 mA. The power is supplied to the process level with a resolution of 12 bits and is electrically isolated. 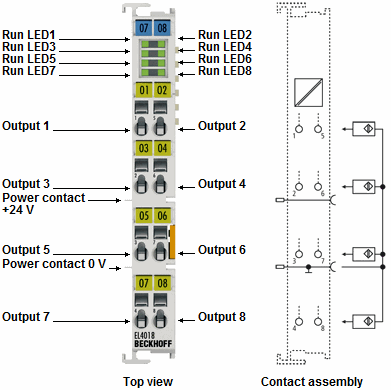 Ground potential for the output channels of the EtherCAT Terminal is common with the 24 V DC supply. The output stages are powered by the 24 V supply. The EL4018 combines eight channels in one housing. The EtherCAT Terminal indicates its signal state by means of light emitting diodes.